The main event of UFC 227 delivered, as reining bantamweight champion TJ Dillashaw TKO’s Cody Garbrandt for the second time. TJ Dillashaw maybe the best bantamweight fighter of all time. At least that’s the buzz around MMA circles after he retained his title against former champ Cody Grbrandt in the main event of last night’s UFC 227. The Duane “Bang” Ludwig protege first defeated Garbrandt back at UFC 217. Dillashaw said after that fight that he believes “No Love” has no chin, a sentiment that he echoed in last night’s post-fight press conference in Los Angeles, Califonia. Just like the first time these two fought, Garbrandt had his moments. He clipped Dillashaw in the early going of round one, but history would repeat itself as Dillashaw came firing back and ultimately ending “No Love’s” night. Dillashaw now holds two victories over Grbrandt. All but assuring Cody wont get another title shot anytime soon, so long as TJ is champ. The two-time bantamweight champion also addressed the long drawn out beef with Garbrandt, a feud that the champ believes was overdone in the media. 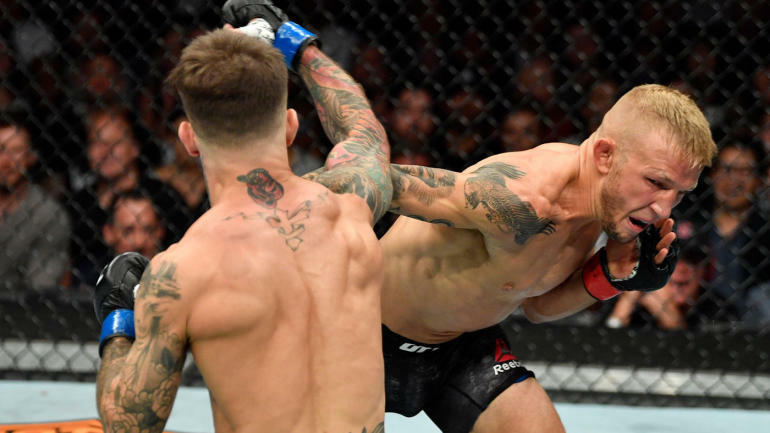 UFC bantamweight champion T.J. Dillashaw discussed his first-round knockout of Cody Garbrandt at UFC 227, his rivalry with Garbrandt, a potential fight against flyweight titleholder Henry Cejudo, Demetrious Johnson’s loss, what’s next, and much more.